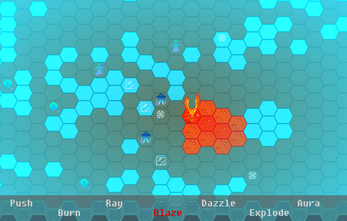 FireTail is a turn-based roguelike game with a theme of fire and ice. It features unique mechanics centred around the trail of fire you leave as you move around the frozen world. The game is challenging, tactical and very punishing in difficulty. Approach with caution. Death occurs by becoming surrounded in ice or ice creatures, making positioning very important. You leave a trail of fire as you walk. Moving on fire is free. Player powers are dependant on how many fire tiles you are adjacent to. You can customise the powers associated with different numbers of adjacent fire as you progress. 6 bosses with unique abilities and behaviours, including the terrifying Queen of Ice. Tiles are by Oryx and the game runs in the T-Engine.